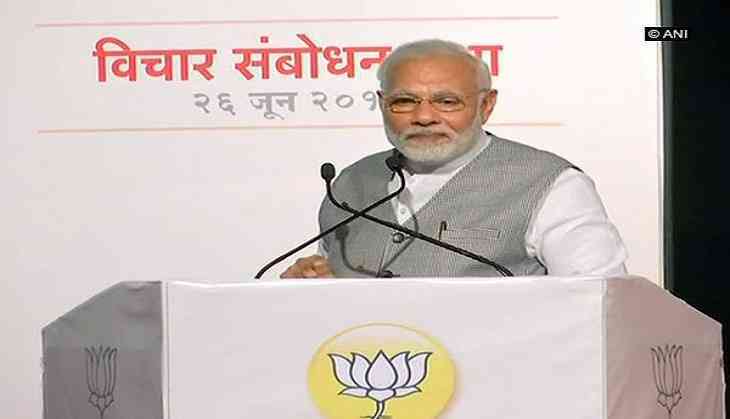 Prime Minister Narendra Modi clarified that the Bharatiya Janata Party (BJP) was not observing 'Black Day' to criticise the Congress Party, but to create awareness among the youth of the Emergency period. "We are not observing black day (Emergency) just to criticize the Congress, we want to make the youth of today aware of what happened. Youth today do not have an idea of what happened during Emergency, and hence do not know how living without freedom can be," he said while addressing a BJP event here on Tuesday. However, Prime Minister Modi alleged that the Congress has always spread a 'fear of the unknown'. Prime Minister Modi, in a veiled attack on the Congress, also claimed that those who have no internal democracy cannot be expected to follow the ideals of the same. "The people who trampled upon the constitution, jailed the country's democracy, are today spreading fear that Modi will interfere in the constitution," he added. Prime Minister Modi lauded veteran journalist Kuldip Nayar and legendary singer Kishore Kumar for their perseverance at the time of the Emergency and concluded with the slogan 'Long Live Democracy' (Loktantra Amar Rahe).